What is the function Terms & Consent? This option will include a confirmation of consent in your survey. At the start of the survey, the respondent will be prompted to consent to the terms of your survey. Without consent, the respondent will not be able to start the survey. After accepting your terms, they can start the survey as usual. At the bottom of each page of your survey, however, they will have a Consent link – when they click the link they have the option to revoke their previous consent and choose No instead. This will delete every answer they have given so far in this particular survey. No data will be saved. The survey appears as unanswered by them. Note: The function is survey-specific and does not affect respondent´s answers in other surveys. How do I set Terms & Consent? 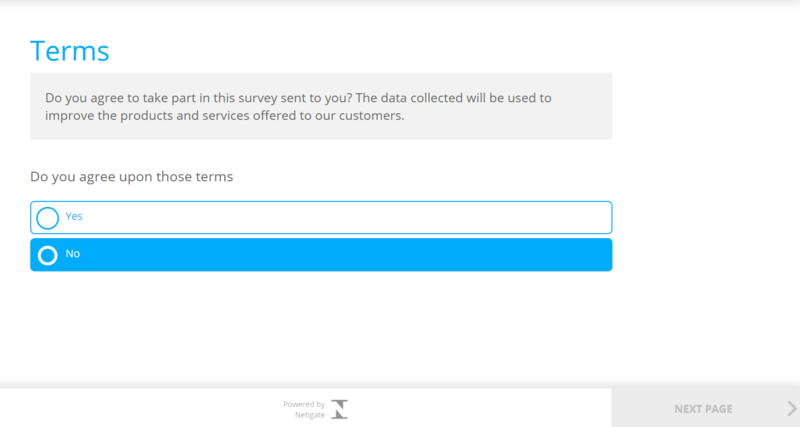 In the Survey Settings you can see an option called “Terms & Consent” with a toggle. If you click the toggle and it turns green, the function is activated. If you activate the toggle, the Terms & Consent page will be added as the first page to your survey. You will have to enter your introduction text by clicking on the textbox. You should write a text that clearly states the intent of the consent. The respondents will see the question in form of a radio button before they see the rest of the survey. It is not possible to continue to the survey unless the respondent has accepted the terms. Even after they have given their consent, they have the option to revoke it whilst filling out the survey. 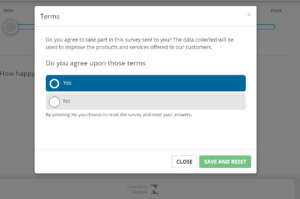 At the bottom of each page in the survey (when you have Display Mode enabled on your survey and show one question at a time, the consent link will be at the top of the survey page), the option Privacy & Consent is visible. Respondents can click this link and a pop up will open up giving them the option to reconsider and revoke their consent. In that case, the survey answers they have given so far will be deleted. Note: If you have sent a survey with an identifier (e.g. Login or E-Mail send-out), respondents have the option to go back into the survey even after they have finished the survey. When they go back into it and revoke their consent retrospectively, the answers they had given before will be deleted. For you, this means that you might have had 300 responses yesterday but only 250 responses today.